Having anything to do with large offices, as a user, can be frustrating. But it is also a headache for whoever must handle the security arrangements. One of the problems is to ensure that the various rooms can only be accessed by authorised persons. Let’s consider, for example, an organisation which must look after various offices and departments, as there would be in council premises, a bank, or the headquarters of a large company. Individual employees must have access to their own offices, and shared rooms, such as the toilet facilities and meeting rooms, but, possibly, they must not have access to the offices of the other employees. Department head must, on the other hand, have access to all the rooms in their own department, but maybe not those of other departments. Lastly, the higher executive levels must have free access to the entire building. A situation like this can’t be dealt with using normal locks, where each door corresponds to a different key, because the higher executive levels would have to be provided with as many keys as there are doors to the rooms to which they must have access. This would be a decidedly inconvenient solution which could easily lead to errors and security issues. 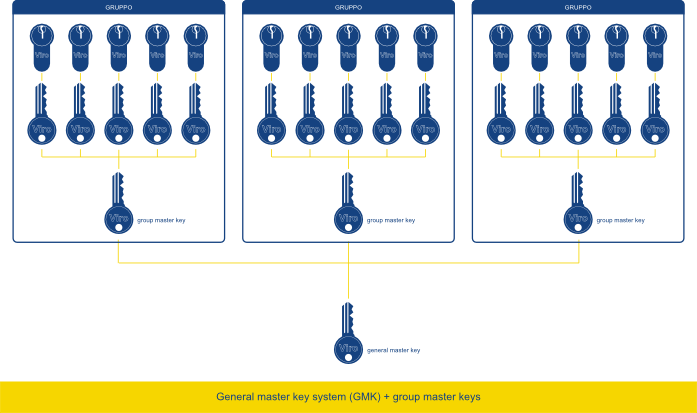 These drawbacks can be overcome by using a key system which allows you to handle various hierarchical levels, such as a master key system (MK) or a General master key system (GMK). The various keys which are each able to open a specific door. The master key which opens all doors in the system. Individual employees will therefore have their own particular key which will allow them to open the door to their own office, whilst the people in charge will have a master key which can open all the rooms. 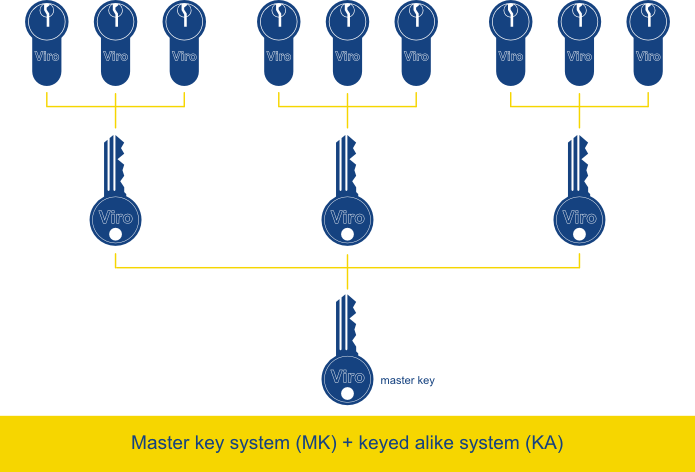 If, as often happens, the employees must have access not only to their own office but also to common areas, such as the toilets, the media centre, meeting rooms, etc., it is possible to combine the master key system with a central cylinder system which allows the various keys to open one or more common access points. 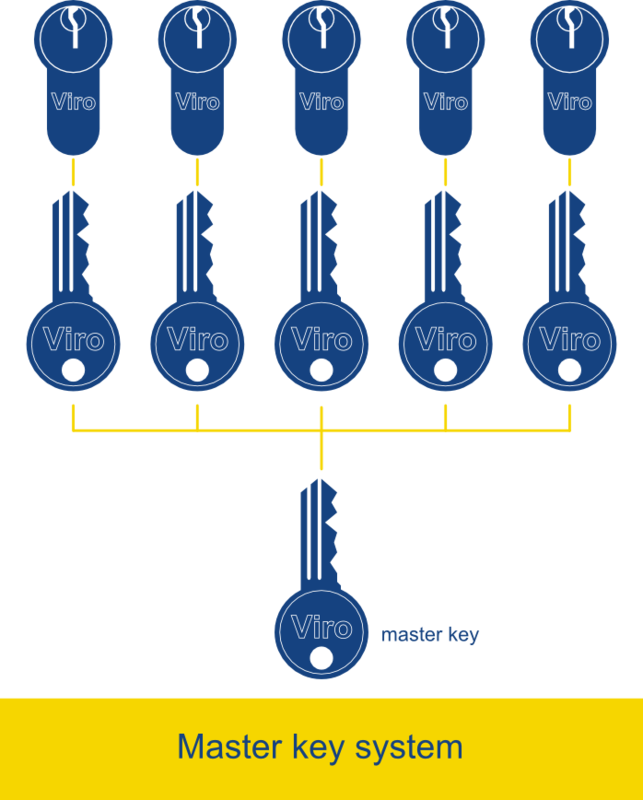 It is also possible to set up a system in which the keys of the individual employees can open more than one lock, when there is, for example, more than one door to an office. 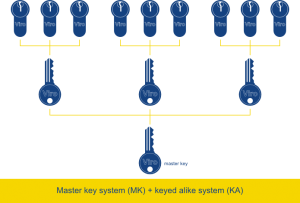 In this case, the master key system is combined with a keyed alike system where different locks to rooms can be opened with the same key. Of course, if the organisation consists of several divisions, one can adopt as many master key systems as there are organisational units. With this solution, however, there would not be a single key which can open all the doors of the organisation, but only various master keys, each of which is able to open the doors of the particular division, but not those of the others. 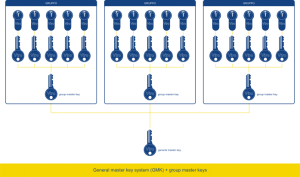 The group master keys which are each able to open all the doors of the specific group. The general master key which opens all doors in the system. 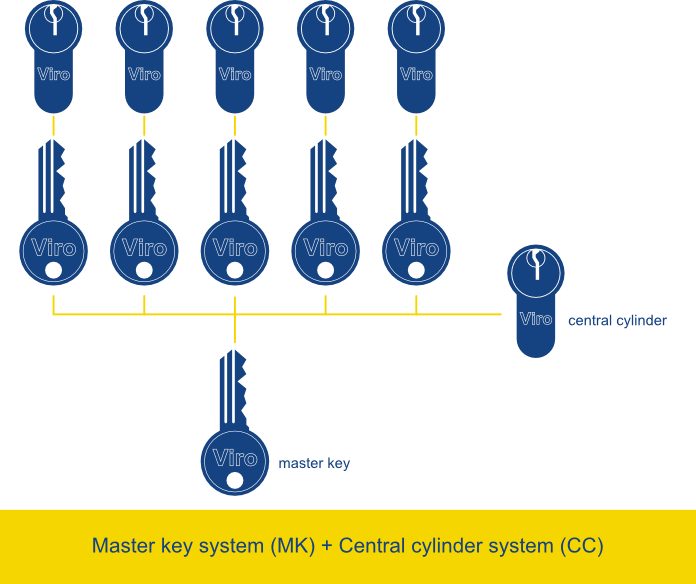 Even the general master key system can be combined with one or more central cylinder systems and/or keyed alike systems. By suitably combining the various systems of special keys one can achieve many solutions, which are able to satisfy even the most complex needs. But the beauty of such key systems is that the more complex the system is the more it is able to simplify the life of those who must use it. 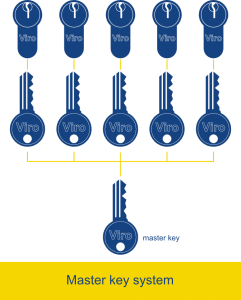 A large number of Viro products, not just cylinders and padlocks, but also universal door locks, rim door locks, electrical locks, locks for shutters and up and over door locks etc., can be made to form part of a special system. This possibility is clearly indicated on the product pages of the website www.viro.it by the wording “All special executions are possible”. 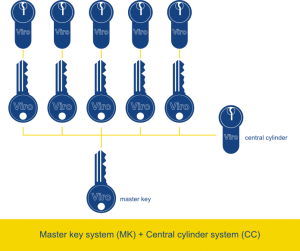 Keyed alike systems, master key systems and general master key systems can be requested directly from Viro retailers, simply by specifying one’s particular requirements. This entry was posted in Locks and Cylinders and tagged offices, special key systems, technology on 20 October 2014 by Mara Rossi.